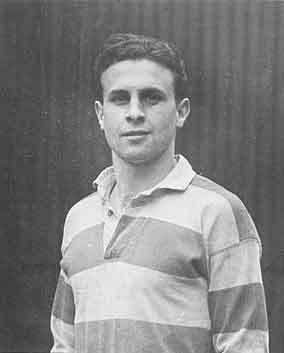 Ken Daniell was a centre who played for Gloucester between 1945 and 1950 before his career was ended by a serious knee injury. He scored over 50 tries for club and county and 44 in 89 games for Gloucester. He played regularly for Gloucestershire during his short career, was selected for Western Counties v Australia and had a reserve card for an England trial. He was a sprinter who could run a 10 second 100 yards and his explosive pace accounted for his prolific scoring. Kenneth N Daniell was born in Gloucester in 1925. His father Norman Daniell was an equally prolific try scorer who played on the wing for Gloucester in the early 1920s. Three generations of the family were runners. Ken himself was a member of Gloucester AC. He ran a creditable second to the British Champion McDonald Bailey (later World 100m record holder and Olympic bronze medallist) in an invitation race at the College Ground, Cheltenham on Saturday August 24, 1946. Ken was educated at the Central School and played for Gloucester boys at the age of 14, before becoming an apprentice and playing for the Atlas Works rugby team. He joined Gloucester in 1945. He was chosen first on the wing because of his pace but quickly moved to the centre as he says to “see more of the ball” behind Gloucester’s powerful pack and their forward-based game. He made his mark in his first season when, playing against Cardiff and the entire Welsh back division, he scored an interception try from 60 yards. He made his county debut at centre in an 8-8 draw with Devon at Exeter in October 1946 (the only match in which the legendary Welsh international scrum half Haydn Tanner played for the county). Ken played for Gloucestershire throughout the season, including the drawn final against Lancashire at Blundellsands and the lost replay at Kingsholm. He was also leading try scorer for Gloucester and at one point had scored 9 tries in 10 games. Ken Daniell was selected to play at centre for Western Counties against the Australians at Kingsholm on 20 September 1947 but was ill and unable to play. He played throughout a second season for Gloucestershire, culminating in a semi-final defeat against Eastern Counties at Bristol. He had another successful season for a Gloucester team which equalled the record number of 29 wins that year. In 1948-49 Ken first suffered the knee injury which eventually put an end to his career. However, the Citizen reports that he was still able to find “that extra bit of speed again and draw the full back before sending in a nicely timed pass to Dangerfield to score in the corner” in a 15-9 win against Neath in January 1949. He played in the drawn County Championship Semi Final against Middlesex at Twickenham in February, but suffered a recurrence of the knee injury and was unable to play in the replay at Kingsholm. He missed the rest of the season. In 1949-50 Ken Daniell became Gloucester vice captain. He continued to suffer knee problems however and only played a few games that season before being forced to leave the field during an 11-3 defeat by Neath at Kingsholm in January 1950. He realised immediately that at the age of 24 his career was at an end.